In conversation with Restaurant India, Harish Babla, CEO of Pure nectar, Philippines based cold press fruit juice Company talk about their India entry. When was Pure Nectar started & what was the idea behind it? Pure Nectar is a brand from Philippines which started 25 years ago and was established as Fruit Magic Corporation by Alan Escalona, who was a trained medical doctor. He wanted to bring healthy living to people, which propelled him to start traditional kiosk to blend juices. Since last 3 years the cold press fruit juice market is exploded & some estimates reveal cold pressed juices make up a $3Billion market, whereas US alone is over $500 Million. 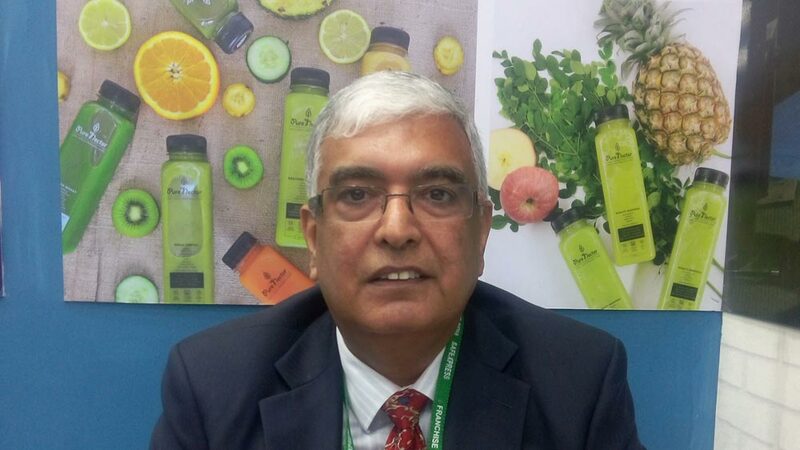 In India there are at least 14-15 significant players disrupting the cold press juice market. The technology to prepare cold press juice has been around for a long time. It was started by a European guy who came to the US and accidentally discovered the formula of making cold press juices. However from last 6-7 years it has started adapting new trends. The interesting fact is that millennial generation are keeping a note of what they are eating & drinking and they want to look at the ingredients. According to news and surveys coming up, more than 48% are willing to pay more for products that are healthy, which do not contain any additives or preservatives. And Pure nectar has no additives, preservatives and artificial sugar, in fact for sweeteners we use fresh sugarcane juice. What about Stevia, nowadays world is promoting stevia as health promoting sweetener? We surely stay away from artificially made products and our products are local resourced. We usually use fresh ingredients, but the problem with cold press juice is that its short lived. Every cold press juice made in India or around the world stays fresh only for 2-3 days. So as a result, products are directly sold to the consumers online. There are some companies which claim that their juices stay fresh for 20 or 21 days, but the fact is that they modify the juices by pasteurising it or maybe by using a process called HPP which is a pressurising method to do it. The other part is that it is not possible to cold press everything as the process includes putting 14 tons of pressure to squeeze out the pulp. For this we have developed a technology called Rapid Blending, so as an example when anyone prepares aam juice at home, they put mango in blender and blend it for 3-4 minutes, but as soon as heat is introduced is this process, the enzymes starts breaking. How many countries are you present globally? What are the reasons, why you are looking to spread market in India? Our product line fits very well with the Indian lifestyle. Pure nectar in India will give a healthy beverage option. There is a large group of vegetarians in India and hence this product can do really well from business point of view. From a business angle, we do not have any retail locations as our business model is very unique and we are offering franchises for every metro city. Let’s talk about your business growth through franchise model. We are going with the franchise model for every city. This means our area developer or our franchisee will open one production unit in about 1500- 2000 square or 150-200 square metre space to make the juices. All our juices are locally made with locally obtained resources, so none of the products are imported. The only thing franchisee is getting is our super cooling technology which increases the shelf life to 14 days. What we want is, a minimum sale of 58 bottles, as the smallest of all refrigerators has this much capacity. As long as it is in our refrigerators, the shelf life is 14 days, but once customer buys it, its life decreases to 2-3 days. But, at least we can sell the products, and product line and shelf life is a big advantage. Who are the partners you are looking at? We are not looking for people from food business, but people should understand the production and efficiency as it a food product and we are following and maintaining an international standard. We want our consumers to be safe and understand the distribution channel. As we sell through whole sellers and retailers, both need to achieve a dominant position in the market. This is because by being the dominant in the metropolitan cities we can reach maximum consumers. Including our working capital, fees and factory and everything, it will take around 1.5 to 1.6 crores but returns are amazing by the end of second year. On the contrary if investors follow our plan they will get 100% ROI. How many bottles do you sell in the Philippine market? How many franchisees do you have in Philippines? In spite of having refrigerators at 200 locations, we are selling over 75000 bottles from 1 location only. By the end of this year we are expecting to expand them to 500 locations. Now we are focusing on putting our refrigerators at various restaurants and giving them an option to sell healthy products to customers using their private labels. When could we see your product in Indian market? We are talking to a prospective client in Bangalore who have visited our production in Philippines and hopefully we are aiming to start soon with top 6 tier 1 cities in India. How was your experience at the Franchise India show 2017? It has been good and after partnership with Fran global we get to meet so many right people in terms of business.